The chart shows how frequently people in the USA ate in fast food restaurants between 2003 and 2013. Hi, everyone. I would be extremely happy to receive some feedback on my recent work. If you have any suggestions on how to improve my report, I would like to encourage you to post them in the comment section. Most importantly, is it an adequate way of dealing with this type of tasks??? 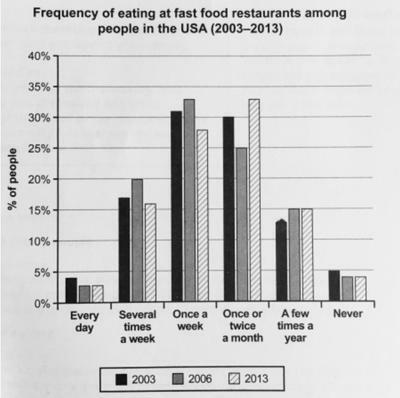 The following bar chart illustrates how often people went to fast food restaurants in the USA in the 3 years (2003, 2006 and 2013). Overall, even though the proportion of people having their meals at fast food restaurants only once per week was the most significant between 2003 and 2006, it was replaced by a group representing people who ate there either one or two times a month in 2013. Furthermore, the lowest percentage was reached by people eating there on a daily basis. First of all, in the start of the period, people having fast food once a week stood at just over 30% and rose to around 33% in 2006, after which it experienced a drop to approximately 5% in 2013. In contrast, the group comprised of people who went to restaurants once or twice a month witnessed a decline of 10% between 2003 and 2006. Following this, it surpassed people eating fast food every week by rising to roughly speaking 33% in the final year of the period. Regarding the lowest percentages, people consuming fast food at restaurants every day remained below 5% throughout the period given. 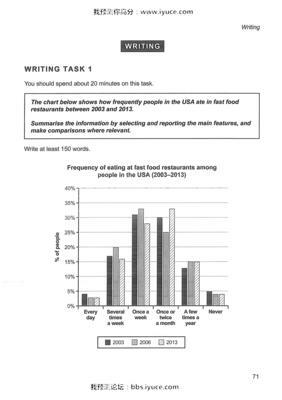 Similarly, the second least serious percentages were reached by people who have newer been to fast food restaurants over a 10 year period. Initially, it settled at 10% in 2003 and dwindled slightly over the following years. The bar diagram illustrates how often USA citizens consumed fast food in restaurants in 2003, 2006 and 2016. Overall, the majority of the population in all the time periods considered ate in a fast food restaurant once a week or once or twice a month. From 2003 to 2016 it is possible to observe a slight decrease in the frequency of eating in fast food restaurants. In fact, in 2003 more than the 30% of the people consumed fast food at the restaurant once a week, while in 2013 the percentage was around 27%. Moreover, less people went to fast food place several time a week (15%) in 2013 compared with 2006 (20%) and 2003 (around 17%). However, in 2006 it is possible to observe a significant higher frequency of eating fast food several times a week or once a week (which reached respectively 20% and more or less 32%) with respect to both 2003 and 2013. Furthermore, the percentage of people who went to fast food restaurants every day or never remained stable in the considered period.